When it comes to taking a little time for us, is there anything more decadent than a pedicure? Maybe there is, but I haven’t found it yet. Pedicures always leave me feeling relaxed and a little pampered, and they are one of my go-to treats when I need a little pick me up. I prefer to do at home pedicures, rather than head out to a spa. Why would I prefer the DIY version over having someone else pamper me? I have many, many, many, reasons. I can get comfy in my PJs. Read a book or watch a movie. Eat my own snacks, and drink my own drinks. Most importantly, after all that wonderful pampering, I don’t have to put my freshly pedicured feet into shoes and head home. I can prop them up on the couch, let them continue to relax and feel pampered, and continue reading or watching until I feel like getting up. Seriously, I find doing them at home so much more relaxing than going out and paying someone else to do it for me. And it’s soooo easy to give yourself a pedicure at home. This is probably going to sound weird, especially considering how much abuse my hands deal with on a daily basis, but I prefer pedicures to manicures. There is something almost decadent about pampering ones feet. For me, I think it’s because a pedicure leaves my hands free for reading or nibbling on something yummy, and it’s super easy; very little effort is required. You can make your pedicure as simple or as indulgent as you want, and still reap the same benefits. I tend to go for the simple approach. Once you’ve gathered up all your supplies it is time for the pampering to begin. Fill basin with warm water. I like to put a towel down on the floor under the basin just in case. Add Salts or Soak and stir to dissolve. Place feet in basin and sit back and relax. Read a book, a magazine or watch a little tv or a good movie. I usually allow 10-20 minutes soak time, depending on how I feel that evening. Use the pumice stone or foot file to tackle rough areas. Don’t be to aggressive, you don’t want to hurt your feet, just get rid of some of those calluses. Use a scrub to exfoliate feet. Massage the scrub over your feet, make sure to get between toes and around nails. Dunk for a rinse then dry. I like to gently pat my feet dry, then follow immediately with moisturizer. Moisturize! Give your feet a good massage as you apply moisturizer to them. Trim Nails and File Nails. Now that they’ve softened up, trim them to your preferred length. Just be careful not to trim them too much. Remove Moisturizer reside from nails with nail polish remover. Paint Nails. Is there a better way to end a pedicure than with pretty nail polish? (Optional) Once nail polish is dry, moisturize feet one more time and cover with cotton socks. Even if you only keep the socks on for an hour, your feet will feel super soft. I’m not the only one who loves a good at home pedicure. I rounded up a couple of my favourite resources to share with you. I’m not sure why, but feet love peppermint! This Soothing Peppermint Foot Soak from A Cultivated Nest is a must have addition to your pedicure supplies. It is easy to make and your feet will breathe a sigh of relief when you dip them into the warm water. The peppermint soothes and relaxes the muscles and tendons in the feet and just generally leaves you pampered. Even if you only have time for a quick soak, this one is a gem! This Easy At Home Pedicure tutorial from My Scraps is awesome! I love how she keeps it very simple, but it’s still a delight to the feet and a great way to carve out a little me time. Easy does not mean skimping on the pampering, in fact, if you follow her suggestions for making your own scrub and cuticle lotion, you’ll add a wonderful element that your feet are sure to thank you for. Lavender is one my favourite scents. Pair it with lemon and you get a wonderful fresh and rejuvenating aroma, perfect for giving your feet a little pick me up. That’s why I absolutely love this recipe for Lemon Lavender Foot Scrub from You Brew My Tea. 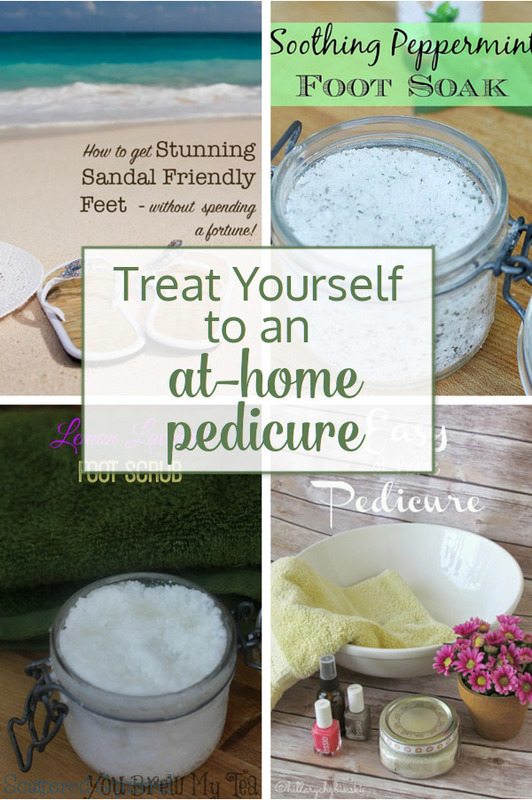 It’s easy to make and a great treat to have on hand for an at home pedicure. Sometimes, taking a break from the whole soak and exfoliate thing is a good thing. 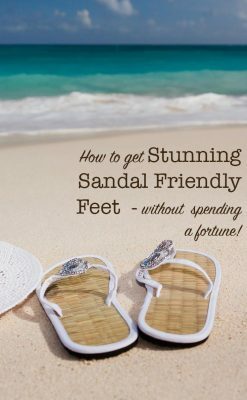 The Super Mommy Club has a wonderful post for How to Get Stunning Sandal Friendly Feet – Without Spending a Fortune, that is not your typical pedicure. It’s a wonderful replacement for a traditional at home pedicure and if feet could weep, your would weep for joy after a treat like this one. 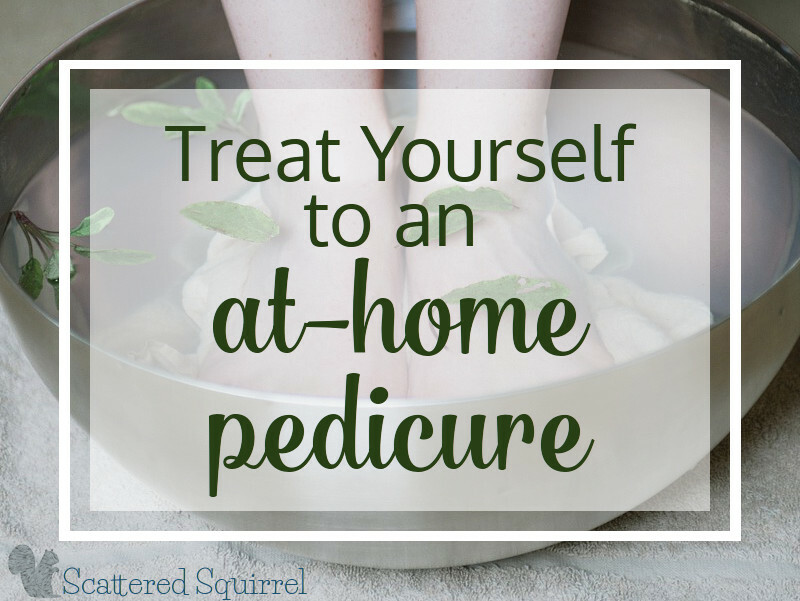 Making time to do little things for me is one of my goals for this year, and an at home pedicure tops my list of ways to carve out a little TLC time without feeling too guilty that I’m taking time away from my family. Making time for self-care is really important, and I don’t know about you, but it’s something that is almost always last on my list of priorities. But if we don’t take that little bit of time for ourselves eventually we’ll get really run down. I know that for me, I need something easy, inexpensive and something that won’t take my whole evening. Pedicures at home check all those boxes. Now it’s your turn! Which do you prefer – at home pedicures or at the spa pedicures? What is your favourite way to give yourself a little treat or a little extra TLC? 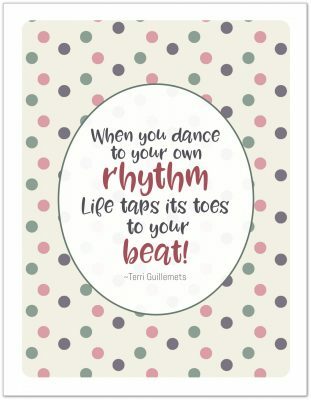 I love this routine you have set out as it seems realistic for me to be actually be able to do! Thank you so much for including our foot scrub from You Brew My Tea in your article! You have great tips and I am definitely checking out the other recipes you shared! Thanks for making such a great foot scrub. It’s heavenly!!! Pedicures are one of my favourite ways to relax. I can’t wait to try your paraffin pedicure….. it sounds like heaven!!! Especially the sit back and relax part!